Turning those complementary colors into complimentary colors. Adult coloring books are all the rage, and for good reason: coloring can relieve stress, reduce anxiety, encourage focus, and engender mindfulness. But let’s be honest. With the endless demands of daily life, who has time to pick up a colored pencil? We have full confidence that one day you will make it past the second page of that impulsively purchased Johanna Basford. But in the meantime, if looking at all of those blank nature scenes – just nagging to be colored in – has you seeing red (or is it carnelian?! ), you needn’t suffer any longer. The creative team here at Powell’s is pleased to offer an alternative: Pre-Colored Coloring Books. 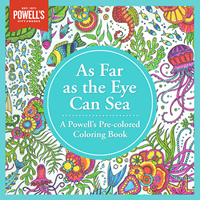 With several designs to choose from, Powell’s very own Pre-Colored Coloring Books are the must-have item of the season. Purchase yours today – serenity is just a click away. I love coloring in my coloring book but I am so terrible at it. Whoever colored in the book I bought from you guys is so much better than me. I display this one on my coffee table and I keep the one I actually color in under my bed. I don’t think of mine as a coloring book I think of it as an art book. I ripped some of the pages out and hung them on my wall, actually. It’s good art, means something to me. This is great! Who has time for these things and what’s more, it’s so pretty to flip through. This is insulting. I am not paying money for something someone else scribbled in. I could sooner stop by an elementary school playground and have it done for free. You’ve sunk too low, Powell’s.